The Chama Peak Land Alliance (CPLA) and Bureau of Reclamation (BOR) are hiring the next VISTA Volunteer to support our organizations and the San Juan-Chama Watershed Partnership. This is a NEW position and will have a different focus than the current VISTA position. You can read about the current and past VISTA Volunteers here and learn more about this new opportunity below and on the application page. Opportunity: We request that interested individuals respond to this inquiry for a Conservation Legacy DOI/AmeriCorps VISTA Volunteer position to be based in Chama, New Mexico. This is a 1 year position beginning in March 2019, with the option of extending to a two-year term. Position Summary: The key purpose of this VISTA Volunteer position is to coordinate outreach to support an initiative that focuses on creating and enhancing multiple linkages between people and the land and waters of the San Juan and Chama watersheds. The people who live in the San Juan – Chama Watershed region are diverse, with many connections to the land and water: spiritual, financial, historical, and emotional. The San Juan – Chama Watershed Partnership honors the many links that exist between all these people and the land and water of these watersheds, with emphasis on funding and coordinating watershed and forest health improvements that preserve the land and water for both local residents and downstream water users. This VISTA Volunteer position will support existing programs and generate new opportunities to create links between the Rio Chama (and the San Juan) watershed with an emphasis on natural resources and the people who live within the watershed as well as those who live downstream who benefit from Natural Resources provided by the watershed. The VISTA’s efforts will help alleviate poverty and empower community members in the region by providing education and skill development opportunities for natural resource workers, small business owners, and other partnerships in the region. The VISTA position will help the San Juan – Chama Watershed Partnership build sustainable capacity by fostering relationships between partners, members, and agency representatives. These relationships will long outlast the VISTA Volunteers’ terms of service. The VISTA will engage in outreach specifically surrounding wildfire mitigation in the region with the intent to further protect the San Juan – Chama Project’s infrastructure and the forested watersheds that surround it. Qualifications: Preference will be given to individuals who reside locally in the region, however, out of state candidates are welcome to apply. Candidate should have excellent communication skills and have an interest in organizational development, poverty alleviation, and conservation. Both college graduates and non-graduates are encouraged to apply; all applications from those 18 and older will be considered. VISTA Volunteers are government employees and must have a valid U.S. driver’s license. 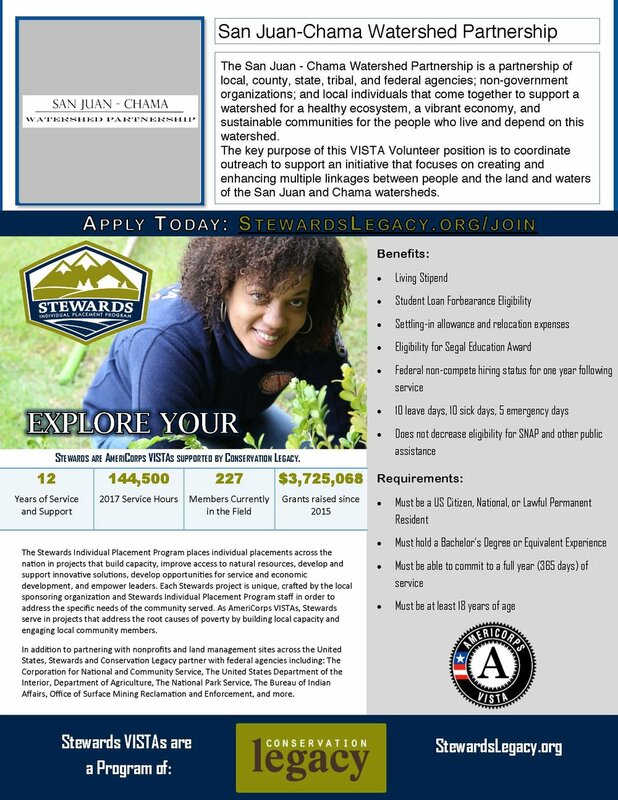 Stipend and Resources: The VISTA Volunteer will be provided with a monthly stipend that is equivalent to 105% of the poverty line for Rio Arriba County. Housing, utilities, office space, computer, cell phone, and a vehicle will be provided by the Bureau of Reclamation. Other benefits from AmeriCorp include a limited health plan, forbearance on qualified student loans, an educational award, and a professional development stipend. Newer Post4th Annual Rio Chama Congreso - Registration Open Now!